I have been fortunate enough to grow up in a multi religious environment, with my family covering the sphere of New and Old Testament Religions from Ultra Orthadox Judaism to Catholicism, and everything in between. It has taught me to respect the beliefs of every one of my family members and to not hold their ideologies to ridicule. I may not agree with them at all, but I respect their beliefs. When I was younger I read a book concerning the wars in Israel. Growing up with a Catholic grandmother who remembers the Nazi’s invading Italy, and how it affected her life and that of her Jewish husband, I am most affected by the right of Jews to have a homeland. I am in no ways religious but I believe in the right of Israel to exist and to exist in peace. In the book I read, Golda Meir was quoted as saying “We will achieve peace when the Arabs love their children more than they hate us.” Nothing has changed. But, this is not a post about Israel, this is a post about the gang wars taking place right here in the Western Cape. There are different factions of people who are taking to the streets with guns and killing each other. Sometimes innocent children are caught in the crossfire and die. Other times, people are gunned down in their homes. This story is not new, in fact, I first heard about gang warfare when I was in Chicago in the 1980’s. It exists all over America and I am sure in the UK as well. I think it is time we all embraced our neighbours,we need to learn to live in peace, and love our children more than we hate our enemies. We need to move towards creating a better place, without the use of guns and knives. And as I write this I realize, this song has already been sung! Give peace a chance! 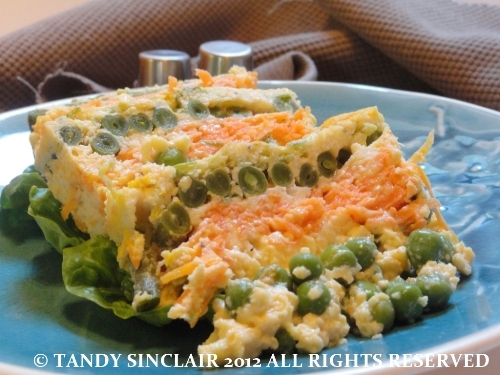 For this recipe, I had to give the peas a chance – to not be on the bottom / top! I did not follow the recipe completely, and what I have listed here is what I would do were I to make this again. I am so looking forward to experimenting with my terrine dish but I decided as a thank you to all my vegetarian readers to start with a vegetable terrine. I hope you enjoy it as much as I have. Have you tried making a terrine? The recipe calls for the vegetables to be blanched first, but I can see no point as the vegetables are nice and crunchy when done the way I did them. I hope that one day we could all live in peace. A day that everyone puts asides their differences. Until that day, I will enjoy this terrine. I have never made one yet. I am always looking for alternatives to exclude gluten so this has me intrigued for so many new ideas. That is just beautiful! I hate to demonstrate such ignorance but what is filled bain-marie? Your vegetable & egg terrine looks just fabulous, my friend! 🙂 I have made several terrines over the years but I am not so fond of meat terrines anymore 🙁 Yours looks so good! If only we all thought the same – unfortunately there are people who just don´t 🙁 Love the peas, love the terrine! Nice terrine and beautiful looking recipe. Well said, Tandy. Fighting is an absolutely futile exercise, and nobody wins, especially the children. A heartfelt post Tandy, and the quote you use sends shivers down me, so sad but so true. And no I’ve never tried to make a terrine before, looking at your photos makes me want to though! I like the look of the split peas in that slice! I have a discount voucher going begging! One day John Lennon’s words will be etched in all our brains and hearts. Always nice to get more veggie dish ideas. The terrine looks lovely. Beautiful terrine. I’m always looking for good vegetarian dishes. On a happier note, your tagine sounds perfect!